No matter how young you are or how old you have got, booking Kerala holiday packages will never disappoint you. 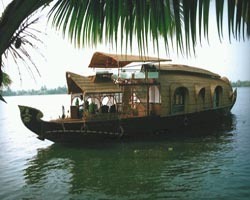 This short kerala tour package of 3 nights and 4 days includes a sightseeing tour of Kochi.. The major tourist attractions are Chinese Fishing Nets, St. Francis Church, Santa Cruz Basilica, Jewish Synagogue, Jewish Street, and Mattancherry PalaceDutch Palace. Kumarakom, a place best known for the honeymooners. It is a cluster of little islands on the Vembanad Lake and make some beautiful memories and Alleppy the beautiful coastal town in the Indian state of Kerala. Book this kerala tour packages now. Welcome to Gods Own Country. Upon arrival our representative will greet you at Cochin Airport Railway Station and then transfer to the hotel. Check-in to the hotel. Later, proceed for a half day city sightseeing tour of Kochi.. The major tourist attractions are Chinese Fishing Nets, St. Francis Church, Santa Cruz Basilica, Jewish Synagogue, Jewish Street, and Mattancherry PalaceDutch Palace. Overnight stay at the HotelResort. Enjoy sumptuous breakfast. Later proceed to Kumarakom. Reach & check-in at the hotel and relax for a while amidst the comforts of your room. Kumarakom is one of the few places in the world where the means for transportation is through boats. Kumarakom is blessed with the Vembanad Lake which has its majestic canals, streams and distributaries along its banks weave an intricate and enchantingly beautiful web. The major attraction of Kumarakom is the Bird Sanctuary which lies at the edge of the grounds of an old estate where a profusion of all kinds of birds can be observed. Domestic birds such as cuckoo, wild duck, egrets, darters, herons, teal, and water fowl can be seen in abundance here, as much as the Siberian storks which migrate to this place each year. Overnight stay at the Hotel/Resort. After breakfast proceed to Alappuzha (or Alleppey) the beautiful coastal town in the Indian state of Kerala. Known as the gateway to the rustic Kerala Backwaters, this town is laid-back and relaxed. If you plan to stay in the town, you can spend your days by relaxing at its lagoons, watching sunsets on its beaches, bird-watching at its lakes, or wandering through its many palaces and temple complexes.Evening Return to the resort and overnight stay.